We present you the program White Backup - a powerful and flexible file backup system for your PC. Highly customizable, yet simple to use, it is designed to meet needs of most demanding home, office and professional users. 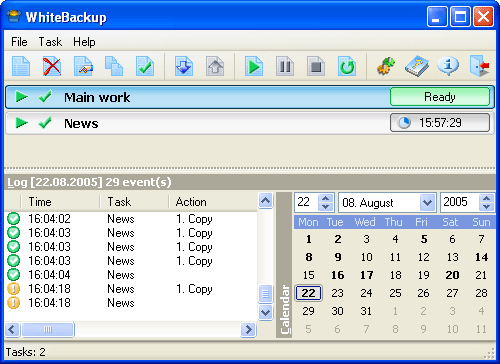 Automation of complex backup jobs using customizable built-in tasks, which significantly simplifes job configuration and maintenance. Simultaneous parallel job execution. Tasks are executed sequentially in a job. Job scheduling and hotkey-based job execution. Backup archive names can be customized to include date/time information and the sequential archive number. Support for hierarchical backup directories. Customizable compression level for the files being archived. Clear and intuitive user interface provides full control over backup job execution and critical problem resolution, such as incorrect or duplicate file names, wrong password, insufficient disk space, etc. Full logging of the backup process and detailed daily reporting. May be used as the job scheduler according to the time-table.